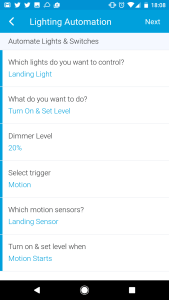 I recently added a new smart bulb to the landing light with the view of triggering it through motion detection. This was not a complex task as my hall light was already configured in a similar way. However after dropping off to sleep and getting up midway through the night, the brightness of the bulb certainly took me by surprise. I was therefore left with a problem. In the evenings I wanted it bright to match my existing lights and clear for everyone going up and down the stairs. During the period 11pm to Sunrise I needed the bulb to be a fraction of the brightness. Just enough for the sleepy eyed to locate the bathroom without shocking them into being fully awake. 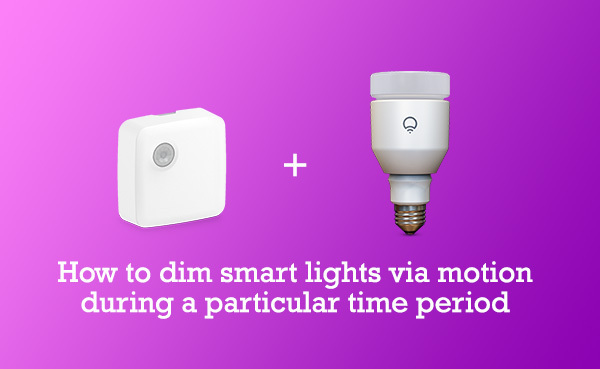 The process is based on setting up 3 different Smart Lighting responses during different periods of time. As it’s currently approaching the summer period here in the UK, it doesn’t start getting dark until around 8.30pm. We’re also experiencing lighter mornings so we might not need the 3rd response. Step 1 – Setting light to trigger on motion at full brightness before usually bed time. 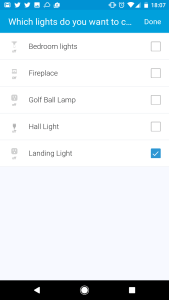 Under the automation option at the bottom of the app, select the SmartApps and locate or add the app Smart Lighting. Open this up and create a ‘new lighting automation’. The app has been well designed so it’s fairly easy to understand. Once you go to bed and settle down, you don’t want the light to activate on full brightness. To make the bulb a different brightness during sleep periods set up a 2nd lighting automation. This time change the brightness and the time period. Finally you may wish to change back to the full brightness depending on the time you wake up in the morning. 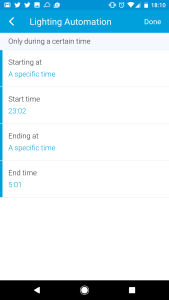 To add this step create a third lighting automation with the waking up times. You may wish to set this at a lower than full brightness to adjust slowly. 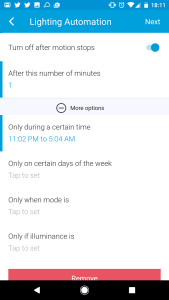 Once those options are configured, your bulb will alter it’s brightness depending on your time period settings. No more waking up to super bright motion sensors late at night.